Peppercam: What's this? Another dress? 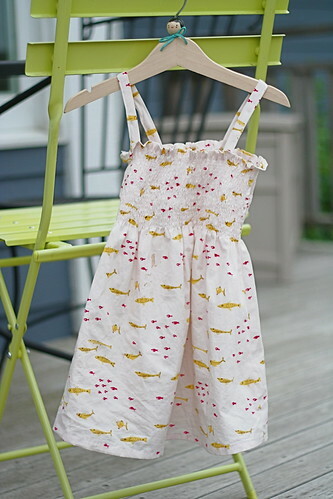 Look at this super cute Mendocino sundress for Bella! And the cutest part is that Bella helped make it. She sat on my lap for almost half the time I sewed it (about 30 minutes), waiting to push the reverse button when requested. The other half she spent trying to play in her new sleeping bag but yelling that she was FRUSTRATED by the ZIPPER and could I come help her RIGHT NOW. You'd think with my pension for ironing, I would have done something about all those wrinkles before taking this picture. You'd think. 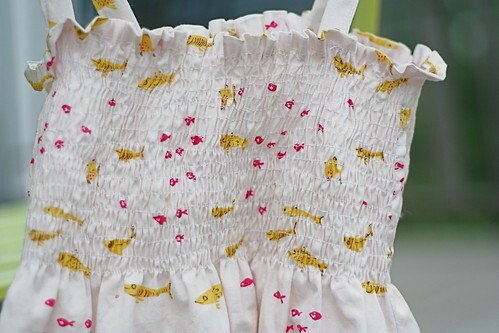 A close-up so you can see the smocking and the fishy fabric (Heather Ross Swim School). Bella put it on immediately and ran into the backyard to show off. 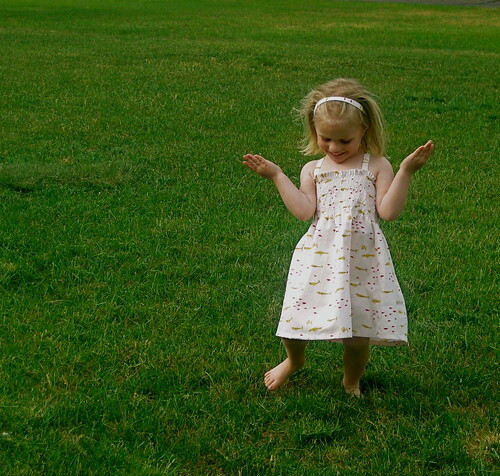 She sang a big song about sewing a dress and putting it on to show daddy and grandma. There were arm movements and a few dance steps and it ended with a big finale of "Me and my, me and my, ME AND MY MOMMMMMMMMMMM!!" I could have just poinked over from the cuteness. Too bad I wasn't really listening since I was busy trying to capture it on video. Which I didn't. Drat. 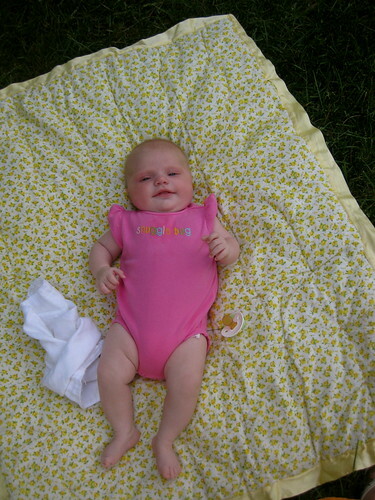 And here's Emily Bea, enjoying the nice weather. What's that Emily? You're wondering where YOUR Mendocino Sundress is? Um. Ooops. I didn't make you one. YET!